How to: Enable and set jumbo frame (Ethernet frame) size for LinkStation - Details of an answer | Buffalo Inc. Enabling jumbo frames support will greatly improve read/write operation to NAS device on the LAN network. 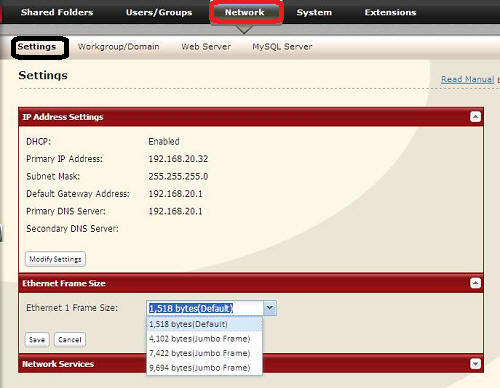 However, jumbo frame setting may not be supported by some routers and host PCs. Internet access may not be possible due to MTU setting variation and limitation of intermediate routers. Generally, clients with Gigabit Ethernet adapters can support jumbo frames on the same LAN segment. Refer to adapter configuration settings to check your host PC's adapter settings before changing the default frame size. Log in to administration Web UI. Navigate to [Network] - [Settings]. Under the "Ethernet Frame Size", click [Modify Settings]. Select the frame size from drop down list, then click [Save].